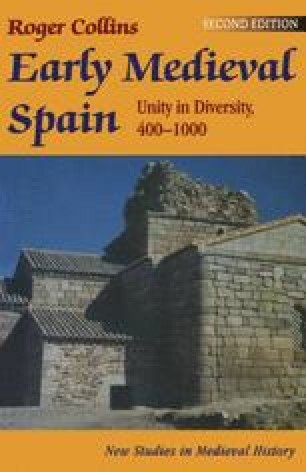 It would be interesting to know something of the social and economic life of the peninsula during the Visigothic period. Some indications can be drawn from the regulations of the law codes but these provide at best an abstract and generalised impression. The peculiar and probably largely localised circumstances that caused the promulgation of particular laws cannot now be known, and insufficient wariness has been displayed in looking out for the presence of anachronistic rulings preserved from the Roman past to fill out the Visigothic written codes. As will be shown, the circumstances of the issuing of the seventh-century codes suggest that their functions were intended to be other than primarily utilitarian. However, despite the pitfalls to be encountered in attempting to use this class of evidence for a picture of life and society in the Visigothic centuries, it is possible from other sources to get more penetrating and particular glimpses of local conditions.